I’ve partnered with Peapod to create this content. As always, all thoughts and opinions are my own. The past 6 weeks have been crazier than ever. Because I launched a new business last week, I’ve been frantically running around trying to get ready for the launch, and one of the things that has suffered the most has been grocery shopping and meal planning. If I thought I didn’t have a lot of time to spare before, it’s 100 times worse now! Luckily, Peapod has saved me more than once during this past month. Not only is ordering my groceries online a MUCH faster way to stock my pantry, it has also helped me during this busy time so that I don’t accidentally run out of staples like bread, milk, and eggs. Thank goodness for that Peapod delivery guy! I don’t even have to leave my house to fill my fridge and my pantry shelves with the food I need to feed my (sometimes demanding) family. Another thing that has been so helpful lately has been my pressure cooker. When I wait til the last minute to prepare dinner, it’s ok. My pressure cooker gets a hot meal ready for the table in no time at all. 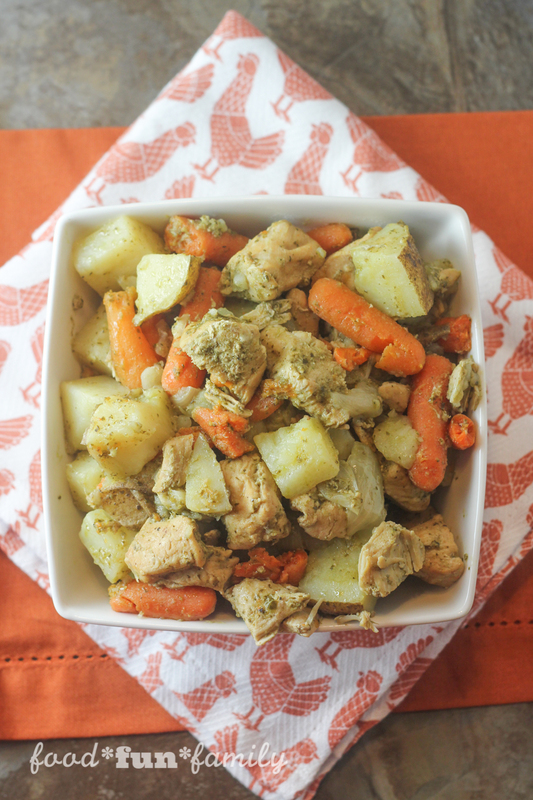 I whipped up this simple but tasty pesto chicken and vegetables recently, and it was a hit with everyone in the family! It couldn’t be easier, with basic ingredients I was able to add to my Peapod cart. 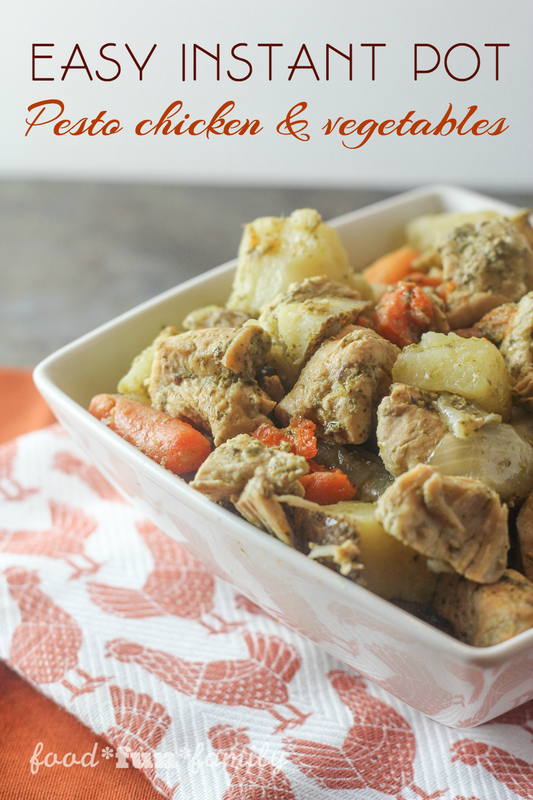 It’s a fun variation to a classic chicken and potatoes dinner. The pesto gives everything a delicious flavor! 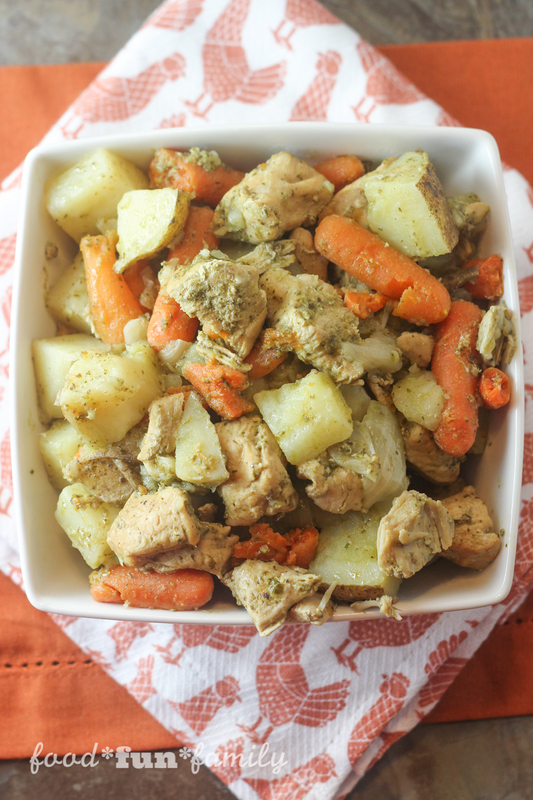 Cut chicken and potatoes into bite-sized chunks. Sprinkle with salt and pepper. 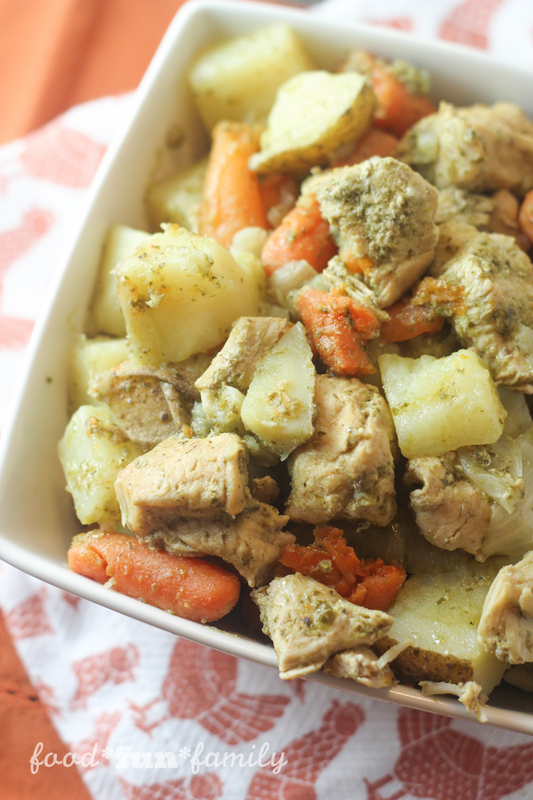 Add chicken, potatoes, chopped onion and carrots to the Instant Pot. Add pesto and 1 cup chicken broth. Stir into chicken and vegetable miszture. Place the lid on the Instant Pot and make sure that the top valve is on "sealing." Select high pressure cook for 10 minutes (press "manual, then + or - to select time). When the Instant Pot beeps at the end of the pressure cooking time, you can let the pressure release on it's own (slow release) or push cancel again and switch the top valve to "venting" for quick release. Peapod, an Ahold USA company, is the longest operating and country’s leading Internet grocer, serving 24 U.S. markets throughout Illinois, Wisconsin, Indiana, Maryland, District of Columbia, Virginia, Massachusetts, Connecticut, Rhode Island, New Hampshire, New York, New Jersey and Pennsylvania. 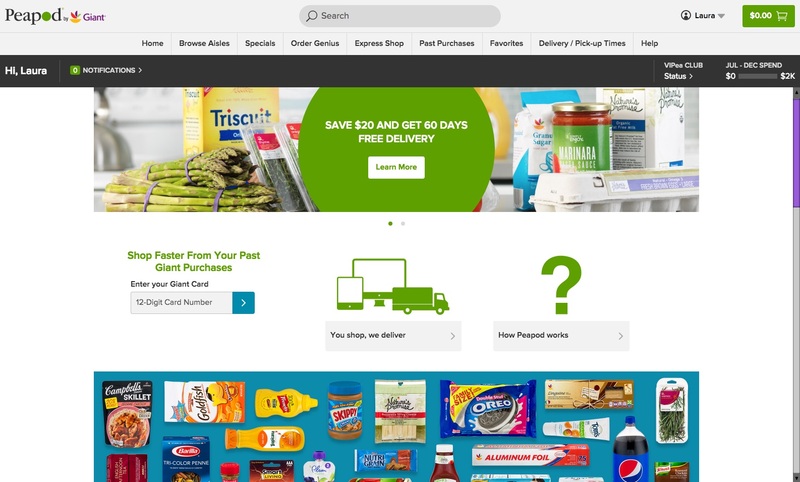 Customers can order online or on Peapod’s free mobile app for delivery to homes and businesses. Peapod has all of the grocery store staples you’d find at your local supermarket in a range of categories: produce; meat and seafood; deli items; prepared foods; natural and organic foods; Kosher foods; floral; office and school supplies; seasonal items; pet items; health and beauty aids and value-priced private labels from Giant. We ordered a bunch of fresh produce as well as meats and we were thoroughly impressed with the quality of the selection that was delivered. I really felt like our order was hand-picked for us (that’s because it was!). Looking for recipes? Get tasty recipes from Peapod’s recipe site: http://fromthepod.com/. Not only will you find delicious, family-friendly recipes, but you can place ingredients straight into your shopping cart. No need to bookmark a recipe and write down a grocery list when you head to the store. Express Shop: Quickly locate and select all for a specific recipe, meal plan, etc. Just type your list into the notepad; click Start Shopping and the products matching your first item will be displayed. Order Genius: Auto-fill your cart with the items you buy most frequently and even recall shopping history from My Giant cards. Past Purchases: Peapod saves your orders so re-ordering is fast and easy! Sort feature: Find products with the best price, to meet your dietary needs, even see which product is most popular. Select your sort preference from the drop-down box at the top of every page. Click the Save Sort link and your products will always be sorted that way. Filter feature: Filter to only see the products that meet your needs, whether you’re looking for dairy-free cereal or peanut-free snacks. 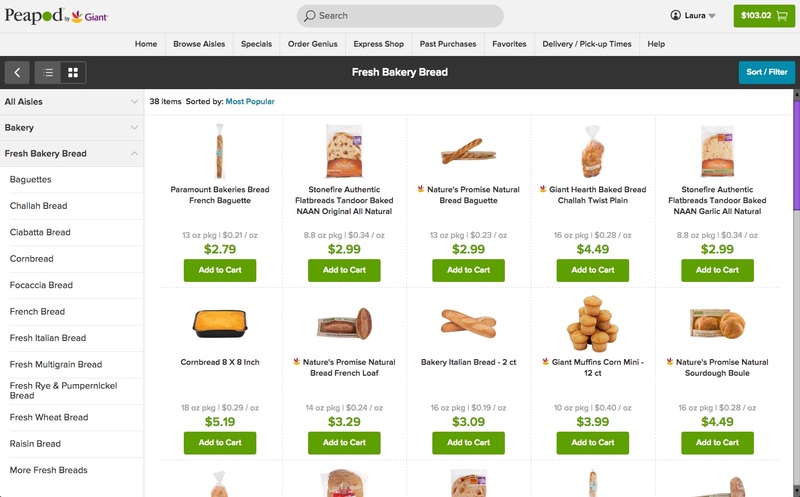 Mobile App: The free Peapod Mobile App allows you to complete your full weekly grocery shopping in seconds with just one click of Order Genius or quickly add items on the fly as you think of them. o Peapod.com shows the running total of the bill as you shop so it’s easy to determine a budget and stick to it. I love that! o The site sorts products from highest to lowest unit cost in each aisle so it makes finding the best value a breeze. o Every week Peapod offers thousands of weekly specials and highlights the sale items customers have bought before in a “My Specials” list. o Customers earn Gas Rewards and A+ School Rewards with every purchase. 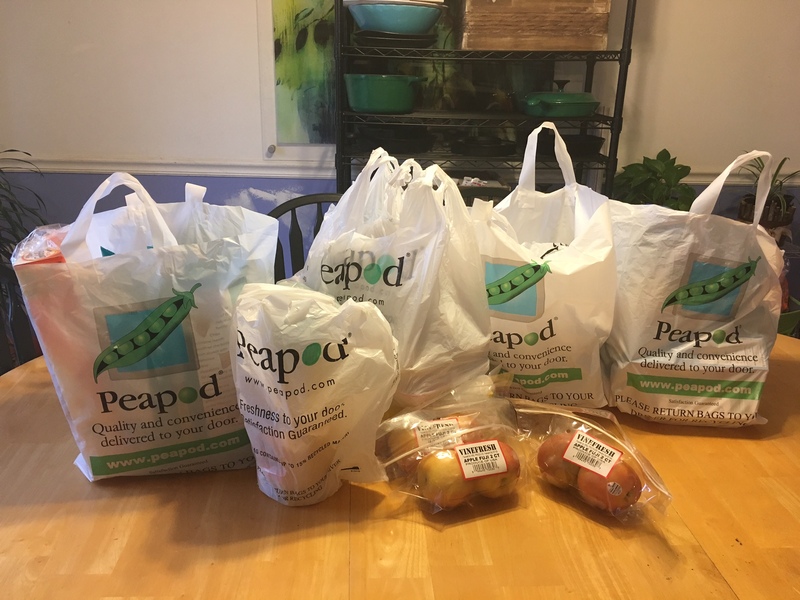 Once you try Peapod, I’m pretty confident that you’ll want to shop this way again and again! Luckily, Podpass makes shopping with Peapod an even better deal. 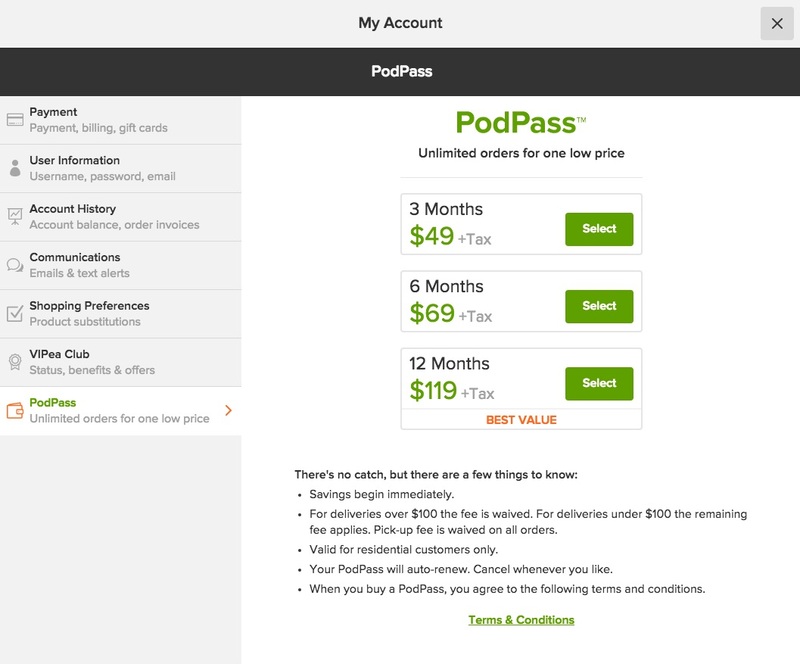 PodPass is available in 3, 6 and 12 month subscription options. Just pay one price for unlimited deliveries within a set timeframe. For deliveries over $100, the fee is waived. Valid for residential customers only. Your PodPass will auto-renew. Cancel whenever you like. Enter to WIN a $119 Peapod PodPass! One winner will receive a $119 Peapod PodPass (that’s a full year of PodPass!). US residents only, please. This giveaway will run through 2/28/2017 at 11:59pm ET, after which a winner will be chosen at random and notified via email. Good luck! I’ve made dishes similar to this and we love it. Thanks for sharing your easy recipe with us on Merry Monday. Pinned. I have not seen Peapod in Ohio yet but it looks like a great way to go. I commented on BEAUTY AND THE BEAST COLORING PAGES! I commented on SNICKERS STUFFED PEANUT BUTTER COOKIES! I commented on GREEK-STYLE CHICKEN WRAPS! I commented on DIY RAINBOW BATH BOMBS! I commented on BRIOCHE BREAD PUDDING WITH CARAMEL SAUCE! We are very limited without a car right now. It is much harder than I imagined. I’ve tried some online sites, but my neighbors let me know Peapod is the best!